The wooden-hulled steamer Cottage City was marked as the first ship manufactured at the New England Shipbuilding Company in partnership with what was to become the mighty Bath Iron Works, both located on the Kennebec River at Bath, Maine, in 1890. To the manufacturers, the Cottage City was technically Hull 1, a way shipbuilders mark the line of vessels they create even before their future owners give these mighty ships their names. The Bath Iron Works went on to become a major builder of ships for the U.S. Navy during the great world wars, and is still operating today. Thus the little 232-foot-long Cottage City was an important milestone in the history of American shipbuilding. Although built as a coastal steamer, with a wooden hull launched in February, 1890, and her machinery installed by the Bath Iron Works by the end of that year, the Cottage City was a successful venture and its launch lead to an order for a sister ship, the Manhattan. After that came contracts for the iron and steel-hulled warships. The Cottage City served the Maine Steamship Line for over seven years along the coast where it was manufactured, carrying passengers and freight between Portland and New York City and points in-between. Her skipper during those years was the late Captain John Bennett of Vinal Haven, Maine. 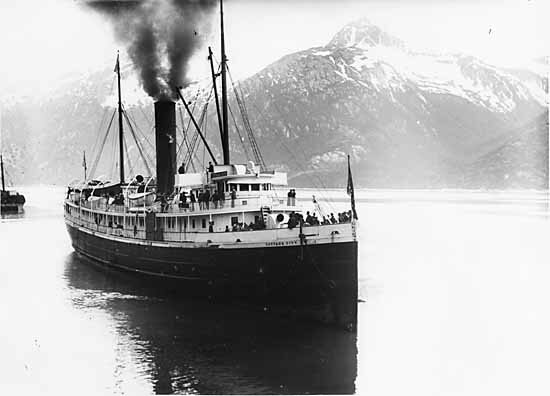 After that the steamer was sold to the Pacific Coast Steamship Co. for service between Seattle, Washington and Alaska. It was on that run that the vessel was wrecked in a severe winter gale along the Canadian coast. The details of the wreck are sketchy at best. From the best information we can find, the Cottage City was caught in a blinding snowstorm and heavy fog and went on a reef off Quadra Island, North British Columbia, on January 26, 1911. The ship was equipped with radio telegraph equipment so an S.O.S. call brought help from Victoria, British Columbia, and Port Townsend, Washington. Everybody on the wreck was rescued, but the Cottage City was lost.